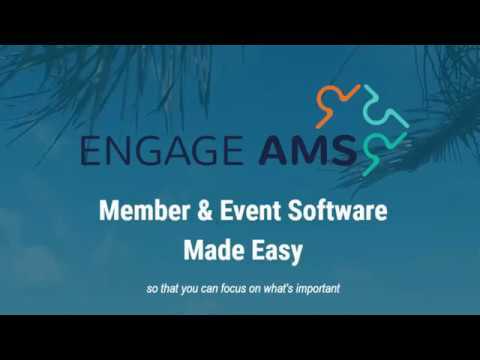 Engage AMS is a website and member management software which enables small to medium-sized businesses to manage their member-based organization with an integrated CMS (content management system) platform, member and event management tools, triggered communications, online payments, and more. Engage AMS provides users with the tools to manage the entire membership process from application through to approvals and dues payments. With the form builder, users can configure applications to collect member data through radio buttons, open text, pre-filled drop-down menus, or file uploads. Users can manage pricing for membership fees, events, applications, donations and products/materials, and set pricing by membership type, coupon/discount codes, sale pricing or volume discount. Engage AMS supports dues payments, member billing, and online payments, automatic billing of renewals, optional automatic approvals, and automated email to members. Engage AMS supports a messaging tool which enables users to communicate with members easily via email and/or SMS text message. Users can configure email notifications to alert members automatically when an application is received or approved, or when a payment is due. Engage AMS also allows users to set email triggers for payment reminders, event registrations, renewal reminders, and more. Engage AMS offers a mobile-friendly design, giving users the flexibility to approve members, generate reports, and more, anytime, anywhere from any mobile or tablet device. Event management tools enable users to manage registrations, pricing and credit card payments for meetings and events. Reporting tools help users make data-driven decisions. Pre-designed reports for applications, memberships, order summaries, event registrations, and event waiting lists can be exported to Excel. AMS implements with our DNN site seamlessly. Excellent support and overall easy to use. Starts at $5,999/year plus $2,999 set-up for 1-300 users/members. Monthly payment options are available. Contact Engage for pricing information. Free demo available. No long-term contract required. • Use Engage AMS to manage the entire membership process from applications through to approvals, due payments and member profiles. • Accept online payments for membership applications, event registrations and sponsorship fees securely online with Stripe integration. • Engage AMS offers a mobile-friendly responsive design, allowing users to approve members and make changes on the go via mobile or tablet device. • Users can set-up email triggers to alert members automatically when their application is received or approved, or a payment is due. • A range of pre-designed reports for applications, memberships, order summaries, event registrations can be exported to Excel. Below are some frequently asked questions for Engage AMS. Q. What type of pricing plans does Engage AMS offer? Q. Who are the typical users of Engage AMS? Q. What languages does Engage AMS support? Q. Does Engage AMS support mobile devices? Q. Does Engage AMS offer an API? Yes, Engage AMS has an API available for use. Q. What other apps does Engage AMS integrate with? Q. What level of support does Engage AMS offer?